Design Trust 2019 April Grant Application is now open. Share with us your ideas and proposals by 20th April 2019. 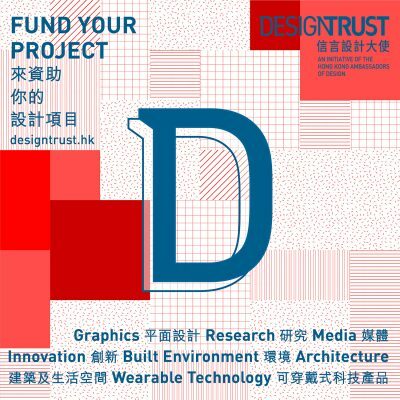 Design Trust offers grants to individual designers, curators, collectives and non-profit organisations for projects and activities that are relevant to various design disciplines to the context and content of Hong Kong and the Greater Bay Area. We support innovative, thought-provoking investigations in various design disciplines from graphics, media, wearables, architecture to the built environment. Please visit our website for more details. Design Trust Grant Recipients from the January 2019 cycle include Cao Fei (China); Ip Yuk-Yiu from City University of Hong Kong (Hong Kong); Jeroen van Ameijde from The Chinese University of Hong Kong (Hong Kong); Stephanie Fung and her team of UpCycling Plus (Hong Kong); Isabel Mager (Netherlands); and Brendan Cormier from Victoria and Albert Museum (London). This cycle’s Grant Recipient Cao Fei (China) will be presenting a series exploring the social history and transformation of Beijing at the Serpentine Gallery; Ip Yuk-Yiu (Hong Kong) will be curating a cross-culture research that explores the multi-faceted nature of space and its production perceived by media artists and designers form Hong Kong and Japan. Preparing for a temporary social design in Sham Shui Po, Jeroen van Ameijde (Hong Kong) will be conducting an intensive workshop that explores various fabrication methodologies for a canopy structure. Determined to promote social and urban mobility through upcycling, team of UpCycling Plus (Hong Kong), including co-founder Stephanie Tung, Lau Wai Cheong, trainee representatives Shirley Lam and Isaac Lam will be designing an innovative cargo bike. Looking into mass-produced commodities, Isabel Mager from Studio Isabel Mager (Netherlands) will be looking into the cycles of smartphones in terms of production, trade and consumption. Brendan Cormier (London) will be studying the iconic Tolix chair, researching its popularity and its influence it serves in the Chinese manufacturing system.